I craved something rich and flavorful, so decided to make butter chicken again. As my last attempt to modify the butter chicken recipe was a success, I decided to tweak the recipe a little more again to give the chicken more flavor and a little bit of a kick. 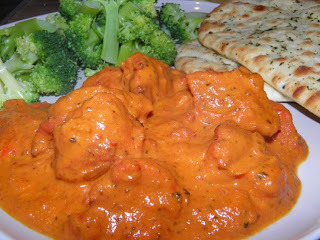 Oh the butter chicken had such an intense flavor and it was just so good! 1. Combine the first 5 ingredients and marinate for at least 2 hours. 2. Heat the butter in a pan and saute the onions until soft. Add the marinated chicken and cook for 10 minutes. Add the passata, chopped tomatoes, and dried coriander. Simmer for 20 to 30 minutes with the lid on. Lastly, add the cream just before serving.